Victoria Smith Ellison graduated in May, 2015, with a major in Educational Studies and a minor in Community Action. 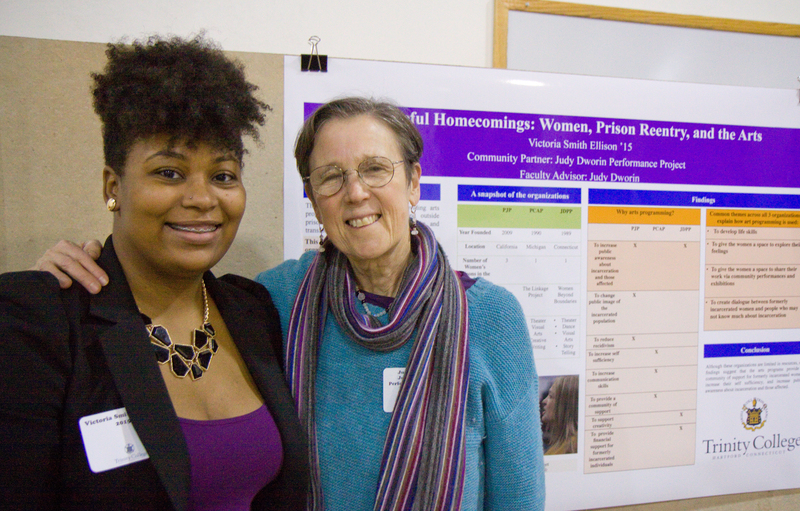 She completed her Community Learning Research Fellows project in December, 2014. Previous studies have highlighted the importance of having gender-responsive programs for women involved in the criminal justice system, that address their different needs, separate from men. Formerly incarcerated women face many challenges as they transition from prison back into society. There are an increasing number of artists with an interest in providing arts programming for this special population as a tool for rehabilitation and transformation. 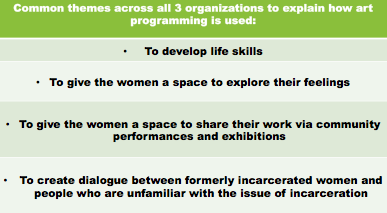 Using website analyses, survey responses, and interview transcriptions, this comparative qualitative study explores why and how three different arts organizations – Poetic Justice Project, Prison Creative Arts Project, and the Judy Dworin Performance Project – use various art approaches to help formerly incarcerated women transition from prison back into society. Although these organizations are limited in resources, my findings suggest that the arts programs provide a community of support for formerly incarcerated women, increase their self-sufficiency, and increase public awareness about incarceration and those affected. Why and how do arts organizations use arts programming to help formerly incarcerated women transition from prison back into society? 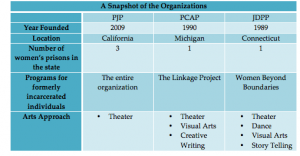 One interesting finding from my study is that the reentry work is a continuation of arts programming that each organization has provided in prisons. Although PCAP was founded in 1990 the reentry component of the program began 10 years ago. Similarly, JDPP was founded in 1989 but the reentry work began within the last 5 years. Both PCAP and JDPP continue to provide arts programming inside and outside prison walls for those affected by incarceration. PJP was created exclusively for formerly incarcerated individuals. 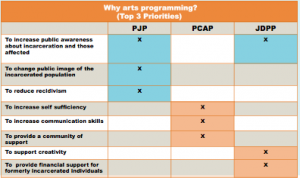 How is arts programming used? Arts programming is used to facilitate individual and community healing and transformation by encouraging self expression, increasing self sufficiency, and raising public awareness about incarceration. 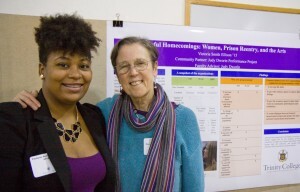 I learned the importance of being flexible during the research process and time management. This semester went by fast. The timeline established for our assignments this semester was very helpful and gave an adequate amount of time to work smarter by meeting different checkpoints along the way instead of waiting until the last minute to complete everything. I also found it helpful to create a timeline with my faculty advisor in which smaller portions of my project were completed to help me move along the process as well.